If there's one thing Bulkhead is really good at, it's smashing stuff. It's his specialty. In fact, he's so good at it that he's even good at it when he doesn't mean to be. In a fight, you can count on him to smash the Decepticons, nearby parked cars, other Autobots, low-floating billboards, and occasionally himself. The irony of it is that he's a natural builder who loves to make things. He'd much rather be creating something, but when you're as big and strong as he is, stuff just sort of seems to get smashed. Robot Mode: Seeing as I own both this version of Bulkhead here as well as the Leader version, comparisons are inevitable. So here goes: Voyager Bulhead is a better match for his cartoon counterpart in terms of build. He''s got the short, stubby legs. He''s got the hunchback look with his head almost in the middle of his chest. He''s got the big, heavy forearms. And the most important thing: He''s got the right gimmicks. Bulkhead''s left arm contains his signature wrecking ball, which he can fire by way of a lever and it''s connected to his forearm by a length of string. The wrecking ball doesn''t exactly fire with a lot of force, but it''s great to see this gimmick included. Even better, when the wrecking ball is stored away inside Bulkhead''s forearm, you can''t really see much of a difference between the two arms, as the right arm has the same black mini-dome in his palm (so to speak), almost as if there was another wrecking ball hidden in there, too. Bulkhead''s right arm also features a small lever which triggers a kind of ''tornado punch'' gimmick, causing Bulkhead to deliver an uppercut. All in all Bulkhead is a very, very close match to his cartoon counterpart. He''s got the right build, the right colours, even the right expression on his face. But he does have one very big problem: He''s not big enough. Despite being a Voyager-class figure, Bulkhead is pretty short. Most of his mass goes into his width, leaving him standing less tall than most Deluxe figures. Seeing that he towers over all other Autobots in the cartoon, that''s a pretty hefty misrepresentation. Still, apart from the size thing, a very good robot mode. Alternate Mode: Bulkhead transforms into a military-style transport van. Not all that much you can say about this mode, really. It looks like what it''s supposed to, a heavily armed, lumbering vehicle. The only slight flaw here is that Bulkhead''s robot forearms, which form most of the vehicle''s rear, don''t form a solid roof. There is a crevice in there. But it''s not much of a thing, really. So all in all a decent, if somewhat unspectacular vehicle mode. Oh, and once again a very good likeness to the cartoon counterpart. Remarks: Bulkhead is the personification of the term ''gentle giant'', one of the most friendly and gentle souls you''ll ever meet, but with enough strength to pulverise anything that ticks him off. He can also be considered the best friend of the Autobots'' human(?) companion Sari Sumdak and he''s the leading expert on space bridges, though most people don''t buy that. As a toy Bulkhead would be near-perfect if only he were bigger. It''s a bit of a rip-off that we get this loveable character in two versions, one of which is at the right size, while the other gets the shape and gimmicks right. As I wrote elsewhere, the perfect Bulkhead would be a mixture between the two. As thing stand I slightly prefer Leader class Bulkhead because he''s at a compatible scale (more or less) with the other Animated figures, but that doesn''t mean this version here is bad in any way, shape, or form. He''s just a tad too small. And for a second opinion the review by LimeWire:Prelude: Bulkhead represents the fun and slapstick part of the series to me. He is a nice, naive, very strong, and wonderfully klutzy character. He's the best friend of Sari Sumdak and spars with her, normally losing the fights and ending up "in great pain". 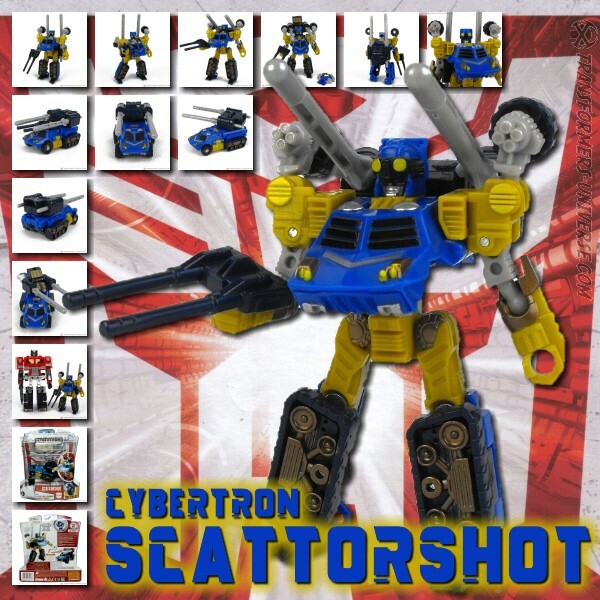 So far he's my favorite character in the series, at least on the side of the Autobots. Vehicle Mode: Bulkhead represents a US Army troop transport, which I think isn't based on any real vehicle - but why should it? It's from a cartoon series, after all. The vehicle itself is excellently engineered and massive. There are no gaping seams, an excellent look, no squeaking, no rattling. All the wheels turn. Also, you can't really guess how the robot inside is supposed to emerge. A 100 percent likeness of the cartoon vehicle. Perfectly done! Robot Mode: Transforming Bulkhead is pretty easy. Nothing like the more complex Movie toys. So no need to have any qualms about putting this figure into a child's hands. To transform Bulkhead into robot mode requires only a few steps. Turn over the rear, turn around the emergency lights, loosen the arms and *click*, they fold forward. If you just let them be, they automatically connect to the torso. Then you fold in the front wheels and pull down, voila, Bulkhead's stumpy legs emerge. The head emerges via automorph, just turn over the front part of the troop transport and his grim-looking mug appears. Now just fold up the rear and you've finished your Bulkhead. The robot mode is about 90 percent show accurate, only the sides and the back are not according to the animation model. I don't really mind, though, too perfect isn't that good, either. With his huge bulk and short legs Bulkhead appears slow and ponderous, just like in the series, leading to people underestimating him. Great! Another thing worth mentioning are the 'curcuit boards' on his arms, coloured black, which show a lot of detailing. Unfortunately those don't really come out with my current light conditions, so no fotographs of those at the moment. The figure is surprisingly posable, despite his bulkiness. The arms can be posed almost freely, the three fingers on each hand can be opened and closed. Which brings us to the next detail: The Wrecking Ball! The ball can be shot out using a tiny lever, ideally you should open the hand first. The ball is fixed to the hand by a rope, just like in the series, to prevent Bulkhead from losing it. The rest of his posablity is pretty good, too. All of Bulkhead's signature poses can be accomplished, even his side profile is so that you can easily replicate his part of the Animated trailer. In some poses Bulkhead reminds me a lot of Marvel's Benjamin Grimm from the Fantastic Four comic book - you can almost hear the words "It's clobberin' time!" coming from his mouth(?). In case you didn't notice, I'm truly taken by this toy. It's rare that a Transformers toy proves as much fun as Bulkhead. I'm looking forward to more - much more. Prelude: Bulkhead’s role in the Transformers Animated Series might best be described as the “adorable klutz“. Whenever he turns up to help someone, he usually causes more damage than he prevents. Not because Bulkhead is awkward or blundering, but his hands are simply not meant for creating stuff or utilizing any sort of fine motor control. They are shaped like the ungainly claw of a crane and can double as a sort of wrecking ball. Being put together this way means, of course, that stuff ends to break around him. Things like windows, cars, streets, and whatever else might happen to be close by. Instead of always demolishing stuff Bulkhead would much rather create things. In fact he’s a talented painter, that is if he finds a brush that fits his paws. Whatever the case, Bulkhead is an Autobot through and through. His spark is in the right place and he always acts with the best of intentions. Bulkhead is also one of very few Transformers in the Animated series not modelled after a character from the original series. So let’s take a look how the toy version of this giant does. Robot Mode: At first glance you might think Bulkhead is too small for a Voyager-class robot, but looks can be deceiving. He’s not very tall, of course, but what he lacks in height he makes up in width. Bulkhead is a very compact, massive Transformer. It’s not hard to imagine that someone like him would be very hard to stop once he got moving. Unlike any of the other Animated figures I’ve seen so far (really just Cybertron-mode Megatron and Starscream) Bulkhead is neither very elegant nor dynamic. Both would be completely out of character for this figure. Despite that, though, this highly detailed figure is very posable. Arms and legs have full range of movement and can be put into just about any pose, so Bulkhead can easily assume all the various poses we’ve seen him do on the screen. Despite his massive bulk and relatively small feet, Bulkhead has a very low centre of gravity, giving him enough stability for all these poses, even when you have him stand on one leg (assuming you’ve properly balanced him, of course). I also like the fact that each of Bulkhead’s “fingers’ can be moved separately. Adds yet more charm to this figure. Overall Bulkhead is very nicely detailed. Just like his cartoon counterpart he’s mainly green, of course, but he features many small highlights in black and some white, too, which manages to make for a very nice looking overall picture. So no flaws to be found in the looks-department, either. Let’s take a look at Bulkhead’s weapons. Just like in the series Bulkhead can fire a wrecking ball from his left hand, which is connected to him via a rope. Not a weapon in the classical sense, of course, and Bulkhead is pretty much screwed when facing an opponent at a distance. No Decepticon should make the mistake of coming into range of this weapon, though, otherwise he could very well end up being squished into foil, much like it happened to Soundwave. Apart from the wrecking ball Bulkhead also features a tiny black lever on his right arm, which causes said arm to deliver an uppercut. I consider this one a funny, if somewhat out-there idea. So all in all I can’t find anything about Bulkhead’s robot mode that I don’t like. He’s simply an all-round great robot. Alternate Mode: Bulkhead’s alternate mode is a kind of troop transport for the police department, a kind of SWAT van for bringing troops to the scene of the crime. The heavily armoured van is of decent size for a toy and pretty much brings all the same positive aspects with it that I already remarked upon with the robot mode. With its six wheels and very stocky appearance the van looks very massive and gives a good showing as a police vehicle. There’s one thing that bothers me, though. On the roof of the vehicle there is, due to the transformation procedure, an opening. You can’t see the inside of the vehicle through it, but it is quite large and obvious enough to somewhat disturb the otherwise flawless look of the vehicle mode. It bothers me especially because I figure that the opening could easily have been avoided or closed. Bulkhead doesn’t feature any gimmicks or such in vehicle mode. Considering that he’s basically just a van, that’s not a negative feature. He does have very nicely made wheels. The actual wheels and the tires are separately coloured parts. Very nicely done and not a given among Transformers. So all in all I can say that the vehicle mode is pretty good. If they’d avoided that opening in the roof I’d have said it was perfect. Conclusion: Bulkhead is a must-have, plain and simple, at least if you’re in any way interested in the Animated figures. In robot mode the figure is fun and as close to its cartoon counterpart as a toy possibly can be. The vehicle mode features a very nice size and good handling, but also a small flaw in the shape of that opening on the roof, which, like I said, could probably have been avoided easily. It’s not a real flaw and probably won’t bother everyone. What remains is a really good Autobot, which I can fully recommend.